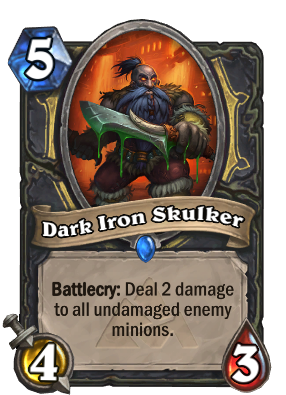 When this card out of Standard with the rotation I'm really going to be sorely missed and I hope they do something about the board clear of Rogue. The golden animation had such potential.. shame the poison doesn't drip off the sword. Just wondering, when dropped into Brann Bronzebeard, would the battlecry be 4 dmg, or would it still be 2 (since the enemy minions would have been damaged by the first iteration of the battlecry)? Good question. I'm assuming Brann's battlecries work in a linear fashion (1st it does the battlecry, then does it again) and it will most likely not activate because it's condition has been lost after the first battlecry. It will only damage un-damaged minions. So it will only benefit from brann if they have divine shield or something. Best arena card for rogue and at rare you will almost always get the option to choose it. Being that paladin is the king of arena right now this card wrecks their board at turn 5 (or wait till 6 for murloc knight + button). Aggro Paladin's worst nightmare. According to the Tempo Storm decklist, outside of Blessing of Kings and Defender of Argus, EVERY SINGLE MINION in the entire deck dies either to the battlecry, or to a weapon hit then the battlecry. You mean, the battlecry then the weapon, right ? Because the battlecry doesn't affect damaged minions. I was referencing Divine Shield minions there. Sorry if that wasn't clear. I honestly wonder if this card can be viable if it just dealt 2 damage to minions, regardless of injury. It's like a Consecration but only for minions and isn't buffed by spell power, as a battlecry. For 5 mana but for a 3 mana body, and for rogue, I think it could be a solution. That will be op , plus doesn't sound like rogue to bland. Although I feel for rogue this card , SI7 A ,etc should be effected by spell damage it would be amazing. Why isn't this card used as much? It's an amazing removal against zoo/aggro. Is it because of Nerubian Egg?